lic sector representatives throughout the Caribbean and Latin America and maintaining an ongoing dialogue with them, while also joining them directly with key players from Member Lines during multiple events and meetings – not to mention the association’s numerous other initiatives, such as training, site visits and input on destination products to maximize guest experience; resources like this publication and town hall meetings to provide mutual understanding between stakeholders and cruise lines; and even philanthropy to give back to the destinations and people. 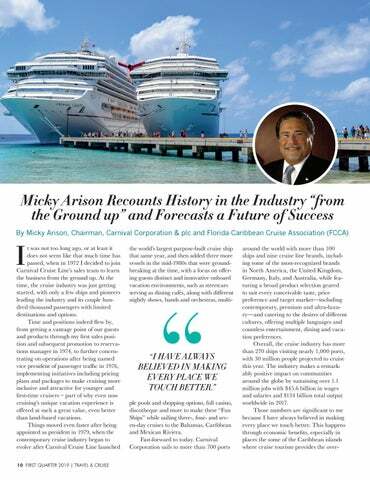 So I am honored to again serve as FCCA chairman, optimistic about the great potential in store for destinations and stakeholders to continue growing alongside this booming industry. But to do so, destinations and stakeholders must realize times are changing, and have the willingness and ability to change with the times, trends and guest desires. 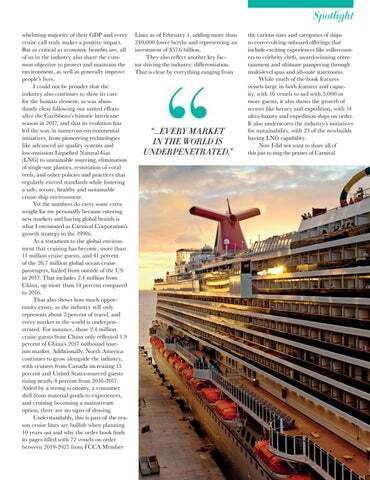 For instance, in the Caribbean there is a clear need for guides fluent in languages such as German, Italian and Spanish for many of our brands and global passengers. 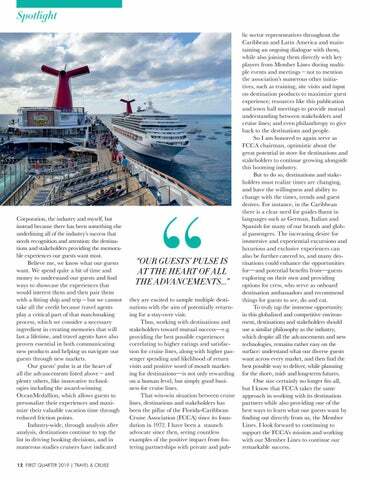 The increasing desire for immersive and experiential excursions and luxurious and exclusive experiences can also be further catered to, and many destinations could enhance the opportunities for—and potential benefits from—guests exploring on their own and providing options for crew, who serve as onboard destination ambassadors and recommend things for guests to see, do and eat. To truly tap the immense opportunity in this globalized and competitive environment, destinations and stakeholders should use a similar philosophy as the industry, which despite all the advancements and new technologies, remains rather easy on the surface: understand what our diverse guests want across every market, and then find the best possible way to deliver, while planning for the short-, mid- and long-term futures. One size certainly no longer fits all, but I know that FCCA takes the same approach in working with its destination partners while also providing one of the best ways to learn what our guests want by finding out directly from us, the Member Lines. 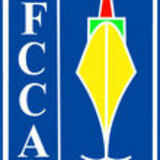 I look forward to continuing to support the FCCA’s mission and working with our Member Lines to continue our remarkable success.